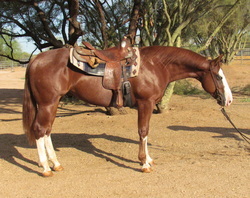 Loma Vista Farm is proud to bring Arizona a great selection of reining and cowhorses for sale by Dealin Dirty. Feel free to call Sharon direct at 480-502-8368 if you have any questions regarding our quality horses for sale. 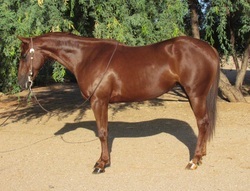 "Deal a Rhapsody" is a 2009 AQHA gelding. By "Dealin Dirty" and out of "Chic San Lena". 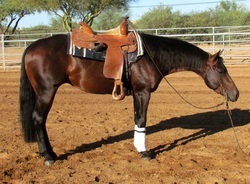 Reining trained, this gorgeous gelding has a great start on him. Great loper, good turner, & a big stopper. Finish him in the reining arena, work cows, or take him in any direction. Price $7500. 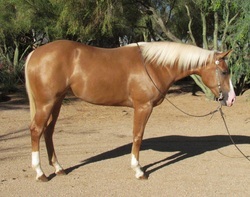 "Gold For The Dealer" A/K/A "Nash" is a 2009 AQHA Palomino Gelding. By Dealin Dirty out of Gigglin Ghost. Started on Roping and getting good. Would make a good head or heal horse. We have roped lots of cattle outside in the open desert. 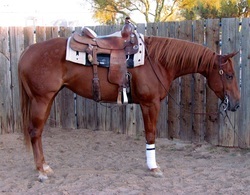 SOLD "Deal Me A Freckle" is a 2009 Chestnut Mare by Delin Dirty out of No Freckles Please. 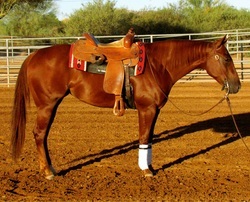 SOLD~"IM a Done Deal" is a 2008 AQHA performance stallion. He is by Dealin Dirty x Peponita Cal Girl. This stallion is a BIG TIME open prospect. He is a plus plus stopper and can really get into the ground. He is a quick turner and has a lot of style. This guy has the "look" and carries his head naturally low. Changing leads is a breeze for him. He just won $1400 at the Cowtown Classic in the Open Futurity. If you want a fancy stallion that can get you into the winning circle, this is the one! 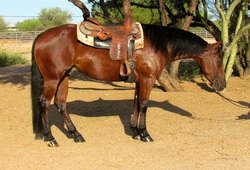 SOLD~"Dealin Sangria" is a 2008 AQHA mare by Dealin Dirty. She is super talented, and is showing major talent stopping and turning!! This mare is bred to perform. 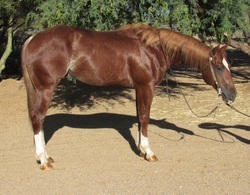 SOLD~"Can We Dance" is a 2008 AQHA mare by Dealin Dirty. She is gentle and kind and easy to ride. Has a great start on her, and is ready to go in any direction. She will make a great all around horse for someone who wants to do a little of everything.